Craig Milkowski is the head figure maker for TimeformUS. To read more about how TimeformUS Speed Figures are created, click here. There is nothing in horse racing quite as exciting for a speed-figure maker as getting to work on a race card after watching a top-class performance. Such was my opportunity Sunday when Game On Dude drew away from the field in the Grade 1, $1,000,000 Pacific Classic, winning by over 8 lengths with seeming ease. Horses winning by open lengths often record lifetime-best figures, or very near it. He was winning for the sixth consecutive time since a loss in the Breeders’ Cup Classic and had recorded TimeformUS speed figures of 133, 132, and 131 during that span. Kettle Corn has been in top form lately. He ran second by a length to Game On Dude in the Grade 1 Hollywood Gold Cup in early July. Later in the month, he scored a victory in the Grade 2 San Diego Handicap. This race was run over the same Del Mar polytrack surface as the Pacific Classic. In his best three performances out of his last five races, Kettle Corn had been rated 124, 123, and 118 by TimeformUS. Delegation entered the Classic a neck shy of an undefeated record in six outings on Woodbine’s polytrack surface. His last race was a dominating front-running score for which he was assigned a career-best TimeformUS speed figure of 126. Game On Dude was a deserving favorite, but on paper this was no walkover. A speed-figure maker takes the times recorded for the races and compares them to what he believed the horses would run based on prior history, class of the race, or both. He then determines how fast or slow he believes the track was that day based on this information, and this determination has come to be known by most as the track variant. I use a computer to generate a worksheet for each race card, complete with all calculations done for “raw” figures, those unadjusted by a track variant. From this the variant is calculated, and in turn speed figures are assigned. I was surprised to see that the Pacific Classic appeared slow in relation to the two other route races on the card. The track appeared several lengths faster for those races. If accepted at face value, the implication is that Game On Dude did not run the exciting race I had anticipated numerically. I was concerned. How could a star of the game demolish the field in a $1,000,000 race and run slower than he has all year? My initial thought was simply to rate the race in isolation from the other two, perhaps due to the 1/4-mile difference in distance. However, I prefer not to do that. I favor making figures based on more than one race if at all possible. I decided to think it over and began to read some of my favorite internet sites. I saw an interesting post at DerbyTrail.com. A poster with the screen name of “Round Pen” questioned why there was such a big difference between the official time, 2:00.69, and the Trakus time, 1:59.26. I am familiar with Trakus, a company that does timing at many tracks in the United States and in several other countries. Trakus uses proprietary wireless technology to track tags that have been inserted into each horse’s saddlecloth. They provide an array of great information, but for this day I was concerned only with the times. As a test, I plugged the Trakus times into my worksheet and right away the variants lined up perfectly with the other two route races. That was a good start to figuring out which time was correct, but I wanted more evidence. While some tracks use the Trakus times as the official times, Del Mar does not. Del Mar provides the information on the track website in the form of Trakus “T-Charts.” It is rare when the times aren’t close, and definitely a red flag that something is amiss when the times are far apart. A study of the official Equibase chart and the T-Chart quickly showed the majority of the difference was in the first quarter of a mile. Equibase reported that the timer displayed 24.19 seconds for the first 1/4, while Trakus reported 22.91 seconds. This difference of 1.28 nearly matches the difference in final times: 1.43. Given this information, I decided to focus on that portion of the race. I downloaded video of both the 2012 Pacific Classic and the 2013 Pacific Classic. Using video-editing software, I was able to time the races from the gate to the finish. Ideally, I would time from the place where the official timing begins after the 45-foot run up, but due to camera angles, that wasn’t possible. Run-up is the distance horses run before the official timing of the race begins. Run-up is a terrible idea, one that is not used anywhere else in the world of horse racing, but that is an argument for another day. I don’t claim the times I give below are exact or official, but they are close enough to show there is a problem. 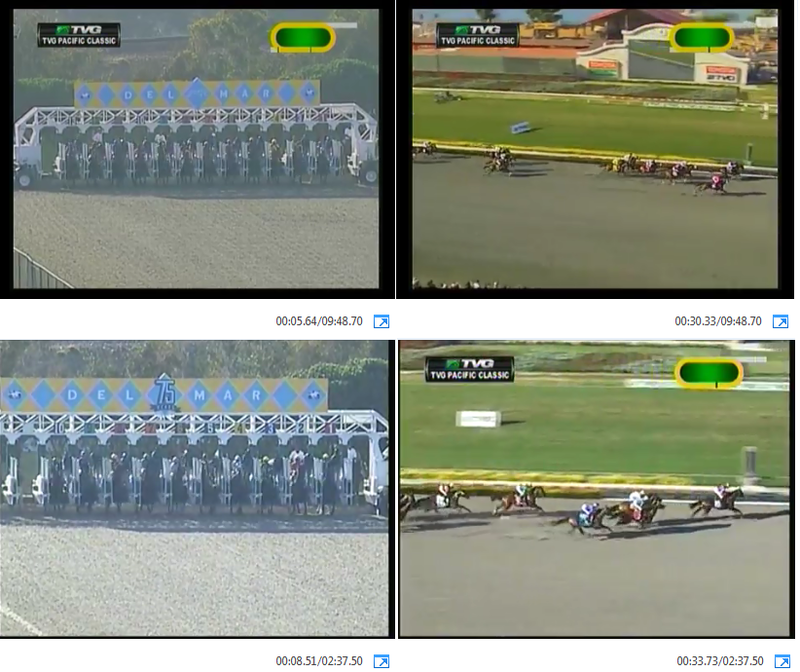 I moved through the video frame by frame and froze the image of each race at the instant the starting gate was fully opened. I noted the time on the video in 100ths of a second. I then followed the horses until they reached the finish line in each race. Since Del Mar is a one mile oval, in a mile and a quarter race, the finish line is the spot where there is one mile to go, and a quarter mile has been completed. I froze the video again and recorded the times. By deducting the time on the video when the gate fully opened from the time at the finish line, I was able to calculate the time it took to run the first quarter mile in both races. The images with times are below, 2013 on top and 2012 on the bottom. The 2013 quarter mile was clearly faster than that of 2012. Gate to finish line, the first quarter in 2013 was run in 24.69 seconds, while in 2012 it was run in 25.22 seconds. This doesn’t really prove anything other than the horses ran faster this year. The interesting part is the reported quarter-mile times. Equibase reported the 2013 time after a quarter mile as 24.19. The reported time for 2012 was 23.61. I’m not criticizing Equibase. The company just reports the times from the track timer, and it does have some checks in place to catch erroneous times. But it seemed very unlikely to me that thoroughbreds could cover the 45-foot run-up, from the time the gate was fully open until reaching the official timing beam, in 0.50 (24.69 – 24.19) as it would appear in the 2013 version of the race. Therefore, I went back to the video to see where the horses were 0.50 seconds after my initial screen shot. Obviously, the above image shows the horses had barely left the gate, let alone run 45 feet to the beam. I think the evidence is overwhelming that the 2013 Pacific Classic time is in error because the timer was tripped early. I don’t know the how or why. Del Mar will have to answer that. But it is clear to me that this error was a big one time-wise, and that it carried over to all the other fractions and the final time. So while the “official” time will be listed as 2:00.69, I think Trakus is most likely correct. Thoroughbred racing is a sport that is clearly struggling. It is also a sport that I love. There is really no excuse for mistiming a race in 2013. The technology is available and needs to be updated. If this sort of mistake happens in a Grade 1, $1,000,000 race, how often does it happen in a $7,500 claiming race at Mythical Downs? This entry was posted in Data Studies, Welcome to TimeformUS. Bookmark the permalink. Fans would be appalled at all the bad times that are given as official, not only final times but internal fractions, as well. While many fans take into consideration the speed figures presented in whatever past performances they are using, it doesn’t occur to them that a figure may be suspect in accuracy and therefore misleading to one’s process of interpretation as part of the comprehensive handicapping process. Can you not time the race from the replay, over and over again from start to finish, from multiple cameras and find the exact time with no need to do a mathematical equation? Point A (teletimer at runup) to point B (finish line). Should be cut and dried. If exact locations can not be pinpointed on camera how are heads, noses and lips separated at various stages in a race? I guess I could do that, but I don’t have access from multiple camera angles. They aren’t available publicly, if at all. Forgetting everything else, this is the simple version to prove the time if off. If you freeze the video on the finish line, then back it up 24.19 seconds, the “official” time of the first 1/4 mile, the horses should be reasonably close to 45 feet from the gate, the reported “run up” distance. But they are not. This is exactly what I did in the last image posted in the article. The horses are still in the gate for the most part, and not one horse has cleared it completely, let alone run 45 feet down the track. 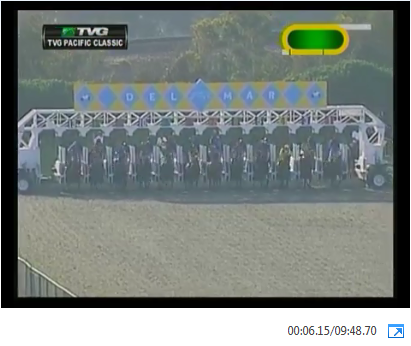 It’s always seemed to me that the starting gate is positioned well behind the distance point–e.g. the gate for a 1-mile race is not at the finish line, but prior to it, and a 1-1/16 mile race has the gate a similar distance before the pole, etc. Is that the 45-foot run up you talk about? Yes, exactly, and for some races it can be very lengthy. For DMR mile races for example, it was 200 feet on Saturday, nearly 1/3 furlong. But they still call it a mile race. Some tracks actually call races 1m70y or 1m40y, but at DMR that is a mile. I knew a couple of handicappers in the early 80s who would calculate the run up distance for each race. They used this distance in calculating fractional times and final times of races. The theory was that a short run up time would lead to a slower first fraction time since the horses had less time to get into full stride and the longer the run up time, the more time the horses had to reach their race speed. Do you agree with this hypothesis? Thanks Steve, have long admired you work. Bravo, Craig! This is example of why I was loyal pacefigures.com customer for many years. Craig digs for details that other ‘experts’ miss. It was an awesome race. Did second wave run time comparable with NW3 Allowance race? Craig, if you consider the previous official rating of Game on Dude (124lb) you will see that the margin of the race fits perfect to the horses around him ratings, including Brazilian Holding Glory. So it seems that he’s ran his best again. It is something that corroborate your opinion regarding the speed figure. Great job with this analysis. thanks also for your (much needed) comment on “run up”! I’ll probably have my co-worker Doug Salvatore do an article on run up. He has written some great stuff on it in the past. Great! also I am not sure if my gravatar shows it here..but this is iceknight on pa.
Nice catch! This is also incredibly important data for analyzing future races/handicappers. This is a beautiful analysis and I like that you clearly voiced your opinion on the concept of “run up time” too. I hope they change that timing method eventually. Thank you! So Craig what timeform rating did Game on Dude received for winning the Pacific Classic? 130 TimeformUS Speed Figure. I believe he now has the top 3 on the season. Since I do always like what the east coast horses do and the races they run against each other do you believe Game on Dude right now will improve on his finish of last year’s Breeders Cup if he faces the monsters of the east? and also do you think he is the best older dirt horse out there? I have noticed there are a lot of horses who run one really big number. Sometimes,the number looks like it has to be wrong,but in most cases in my opinion,the number is correct and from what I’ve seen most of these one number horses do bounce in their next race. Do you have any opinion on these one number horses ? I’ll keep it brief since this off topic…I’m not a big believer in horses bouncing. I think more often than not horses run top figures under highly favorable conditions that aren’t encountered with any regularity. Verrazano in the Haskell was an example. Craig is one of the best if not the best at making figures and catching instances of inaccurate timing at various tracks. It is a much bigger problem than people think and I’m not sure that the tracks really care. I’ll work on the moderation skills! Thanks for the compliment. You are correct, this happens much more often than people realize all around the country. We have some good tools in place to catch a lot of the mistakes, though I’m sure some slip by as well. Racing will get there, have faith! Nice evidence of why I’ve found Timeform to be a reliable source since starting to use it for the Saratoga meet. You guys really do some great work. Thank you! That is really great work. I am impressed with the work of figure makers. It is a true art. Some days,I have no idea how anyone could make a decent figure. Thanks Aaron, it can be a tough job, but I love doing it. One thing is for sure, all figures are not easy to make! What do you think of the Beyer ratings?